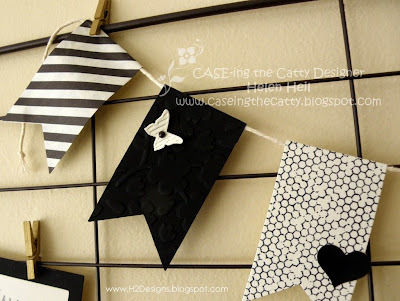 It's time for the 23rd Challenge at CASE-ing the Catty & this week we are taking inspiration from the SAB & Occasions catties, using a combination of SAB & Occasions stamps & accessories on our project. 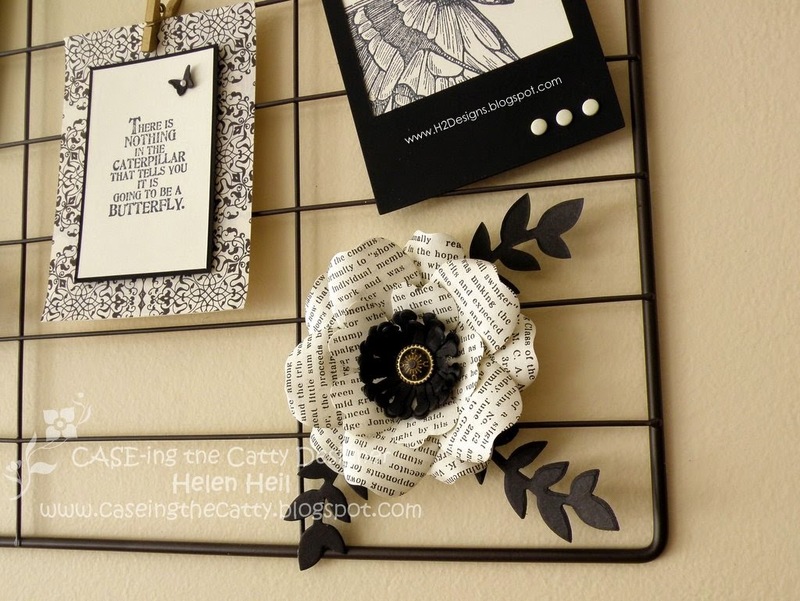 When I first saw the Hello Life Project Kit in the Occasions catty, I "had to have" the wire frame. I love the industrial look that is around at present, where home decor replicates furniture, fixtures & fittings that could have been taken from an old factory or commercial premise. 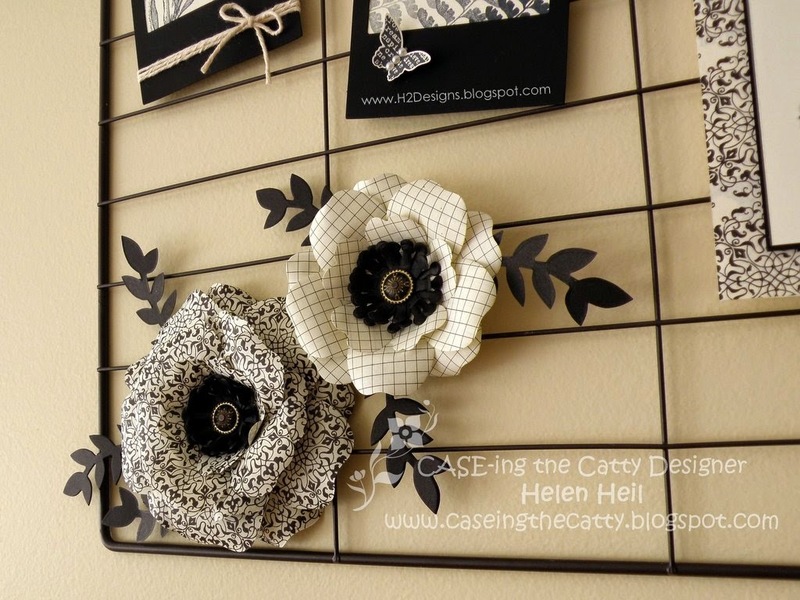 Dimensional flowers & banners feature very heavily in both catties, so I used that as a starting point & adopted a very simple palette of black & vanilla, inspired by the Typeset DSP. 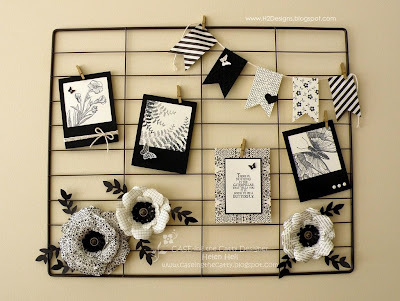 I only used a handful of elements from the kit (i.e., the wire frame, two black photo frames, a black mat which I turned into a third photo frame, the black banner & the black heart on the middle banner. To create the banner string, I stripped the metallic thread from Gold Baker's Twine to leave just the vanilla cotton. 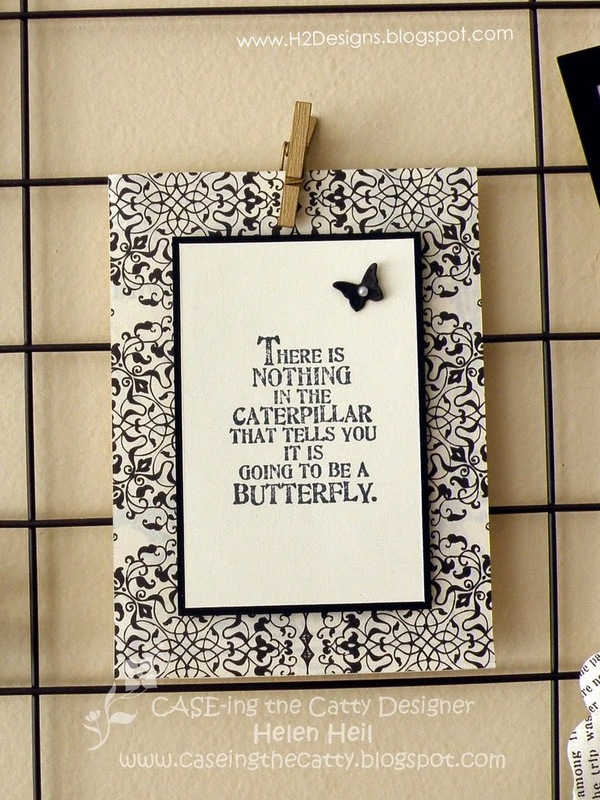 I added the black banner which was embossed with the Spring Flowers embossing folder (unfortunately it doesn't show well in the photo) & added a teeny embossed butterfly with a pearl centre which was coloured with a black sharpie marker. The middle banner is a vanilla piece stamped with the honeycomb image from the Butterfly Basics set. 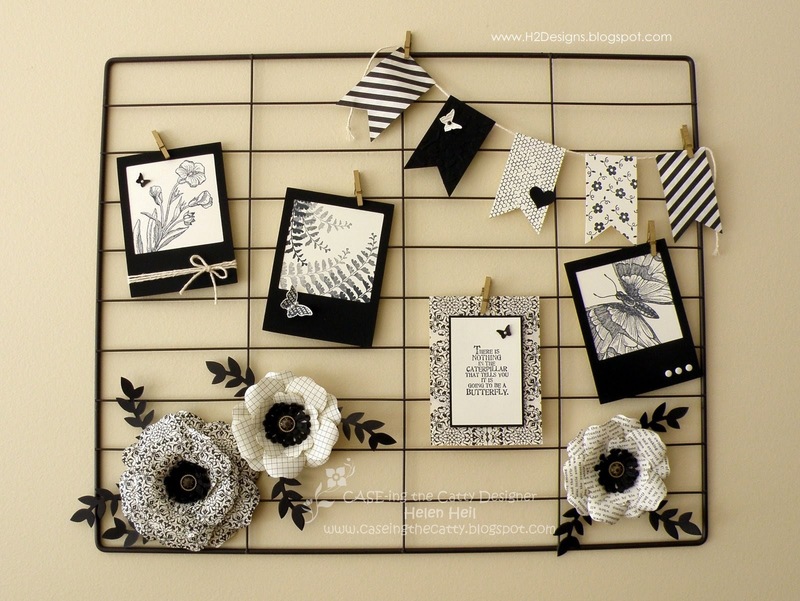 The floral image on the fourth banner comes from the SAB set Simply Wonderful, stamped on vanilla. The diagonal stripe print is also from the Typeset DSP. The kit comes with silver painted mini pegs but I substitued gold ones from the Annual Catty to match the Antique Brads in the flower centres. There are also some vanilla Candy Dots on one of the frames. 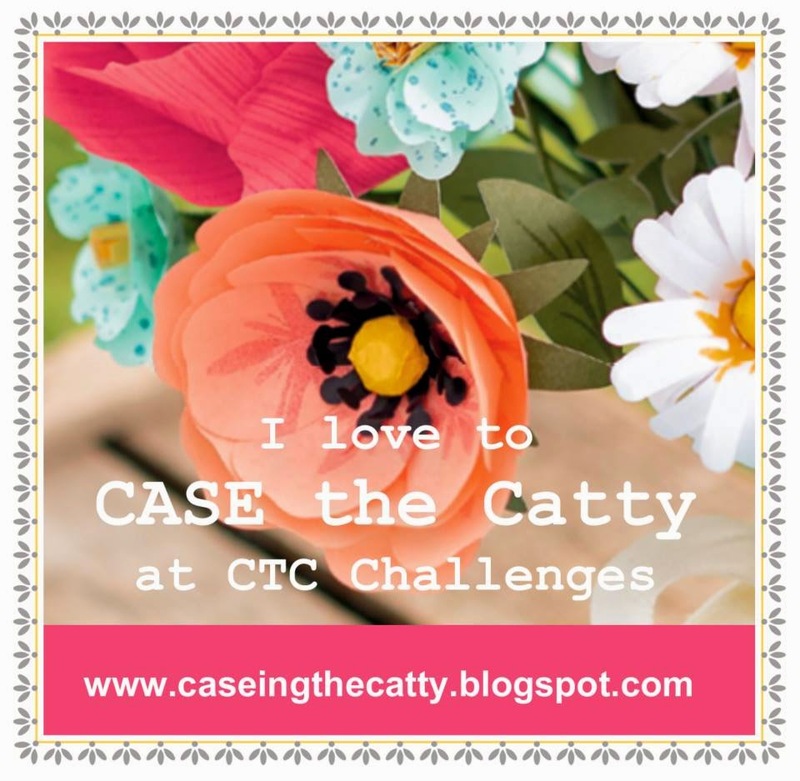 We hope you can play along with us at CASE-ing the Catty this week. The Design Team, including our Guest Designer - Julia Quinn, have a wonderful group of projects to inspire you.